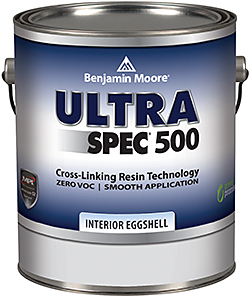 Ultra Spec 500 zero-VOC acrylic interior paint has a fast-drying formulation. With a proprietary zero-VOC colorant, it remains VOC-free after tinting regardless of the color choice. Provides high hide and broad coverage when rolling or spraying; delivers a smooth application with good flow and leveling; and is durable and washable. Available in primer, plus five sheens.